Ebin Rec George releases new LP ‘Forward’ | Sonic Smash-Music! The renowned instrumentalist known as Ebin Rec George has released his latest LP album, titled, “Forward.” The album is composed of 12 tracks for an approximate total listening time of one full hour. It has been released on the Praise Media music records label. Ebin Rec George is widely recognized as one of the world’s most skilled instrumentalists as the holder of the world record for having consecutively played the most instruments in an hour. George played 27 of them one after the other to win the title. 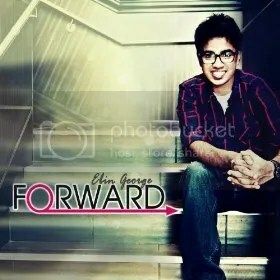 As is made clear by the album’s introductory overture, Ebin Rec George is a devout and faithful Christian, and his album, “Forward” has been arranged, performed and produced with the goal of glorifying the Christian God in mind. George cites as main artistic influences such masters of music as Michael W. Smith, Paul Baloche, Israel Houghton, Yanni, and Kenny G. He has been playing music since the age of two years old. He is a Christian worship leader and preacher currently residing in Dubai, United Arab Emirates. Born 2 February 1992 in Bahrain, Ebin Rec George is skilled at both electronic and acoustic drums and percussion, electric, acoustic and bass guitar, piano and keyboard, Arabic drums, recorder, soprano saxophone, violin, xylophone, accordion, djembe, Irish chanter, kalimba, tambourine, maracas, timbales, harmonica, dhol, keytar, tabla, and the chenda, as well as at singing. His performances have been attended by such grand personages as Dr. Ayoub Kazim, Director of Dubai International Academic City, Dr. Tiju Thomas, Consul of Economic Affairs for the Indian Consulate at Dubai, Dr. B. Ramjee, Ex. Director of Manipal University’s Dubai Campus, Mrs. Uma Prasad, Student Counsellor of Manipal University’s Dubai Campus, Mr. Abraham Mathew, Vice-Principal of the Emirates National School at Sharjah, and Mr. Steve Thompson, Director of Berach International Music, UK. “Forward” by Ebin Rec George is available online worldwide. This entry was tagged ebin rec george, mondotunes.